Paddlers will trek 32 miles from Catalina to Manhattan Beach, Aug. 27. TWO HARBORS — Paddlers from around the world will congregate at Isthmus Cove the final Sunday of August and, at sunrise, embark on an aquatic marathon across the Catalina Channel and toward the upper reaches of Southern California’s South Bay. This summer marks the 40th edition of the Catalina Classic Paddleboard Race, bringing users of the human powered craft together for a competitive race from Catalina Island’s West End to Manhattan Beach Pier. Dozens of paddlers are expected to participate in the “Granddaddy of All Paddleboard Races,” which takes place Aug. 27. Paddlers will race for 32 miles between the Two Harbors area and Manhattan Beach using only their hands and a paddleboard (measuring between 12 and 19 feet in length). Competitors can only use their hands to propel them through the water – though the elements (wind, currents, swells, marine life, etc. would certainly play a factor). The Catalina Classic Paddleboard Race is the oldest such competitive event of its type. A paddleboard crossing out of Catalina was first achieved in 1932 – the same year Los Angeles hosted the Summer Olympic Games. Completing the crossing in a little less than six hours was Tom Blake; he paddled his way to the finish line ahead of his two closest competitors, Wally Burton and Pete Peterson. A former L.A. County lifeguard (Bob Hogan) made the event an official race in 1955. Since then a smorgasbord of accomplished paddlers competed in the Catalina Classic Paddleboard Race, including Hogan, Kemp, Aaberg, Mike Bright, Mike Doyle, Ricky Grigg and Joe Quigg, among others. Grigg reportedly won the inaugural 1955 race in 8 hours, 27 minutes. 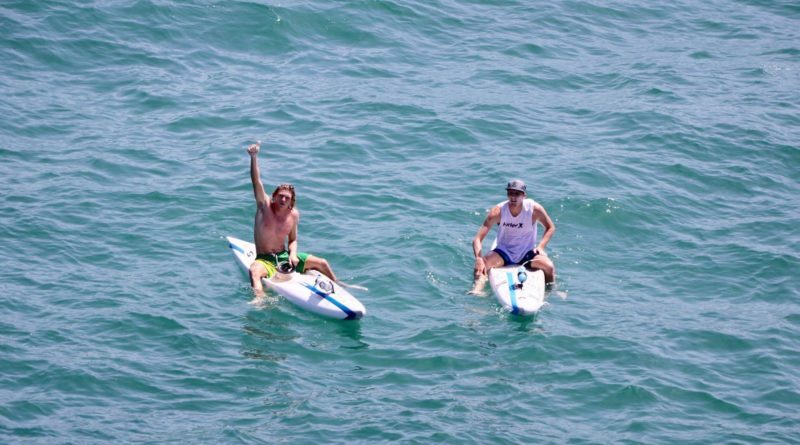 Manhattan Beach’s Max First, 27, won last year’s Catalina Classic Paddleboard Race, finishing ahead of the pack in 5 hours, 19.4 minutes and reportedly aboard his 18-foot, 4-inch paddleboard. It was his second victory in three years. There were 93 participants in last year’s race. Hogan, the race’s founder, passed away in Orange County in 2015; he was also known for launching Hogan Boatworks and helming Discovery, a 50-foot charter yacht.